Under the Constitution of the United States, the power to appoint a justice of the Supreme Court of the United States rests on the President of the United States who appoints the nominee and asks the Senate to confirm that appointment. The Senate Judicial Committee holds hearing and based on responses received from the nominee recommend the nominee for the vote by the entire Senators. It requires minimum of 60 votes to confirm a nominee. That is how it has been for many decades. The supermajority affirms that both members of the Democratic and Republican parties have confirmed the nominee and such validation is important for smooth governance. There is no timeline set in the Constitution as to when a President during his presidency can or cannot appoint a nominee for a vacant seat in the Supreme Court. So on February 13, 2016, when Justice Scalia died, his seat became vacant and under the Constitution of the United States, President Obama had the power to appoint a nominee for this vacant seat. Soon after Justice Scalia’s death, President Obama nominated, Judge Merrick Garland to fill the vacant seat. Republicans in the Senate refused to even meet with the nominee, let alone to schedule a confirmation hearing. They argued that given that President Obama was in his last year of presidency, the appointment should be left to the incoming president. Of course, they were hoping that the new president to be a Republican. The irony is that Republicans had previously approved Judge Merrick Garland and found him a reasonable and centrist judge. But suddenly he was not good enough, because a Democratic President appointed him. Given that it was the year of campaign and election all attentions were focused towards the campaigns. Surprisingly, Mr. Donald Trump won the Republican primary and even more astonishingly, Mr. Trump won the presidency of the United States, even though he received about three million less votes that his rival, Secretary Hillary Clinton. 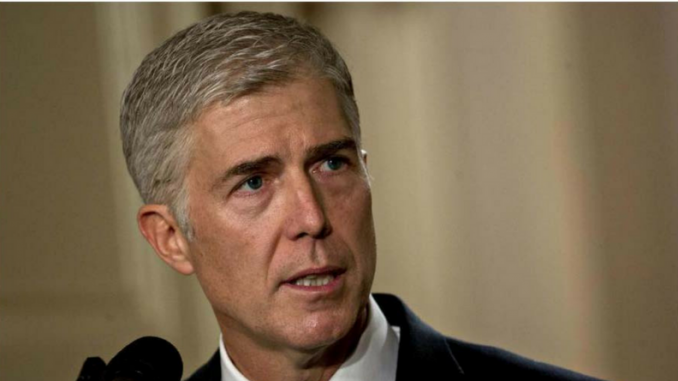 Once he took the oath of office, President Trump appointed Judge Neil Gorsuch who is known for his right wing and very much pro-corporation as the candidate for the vacancy in the United States Supreme Court. Then came the hearing during the confirmation and because of responses that were given by the nominee, Neil Gorsuch, many Democratic Senators decided to vote against him. By doing so, the nominee would not receive 60 or more votes, so the President Trump would have to appoint someone else. There comes, Senate Majority Leader, Mitch McConnell, to the rescue. He decided to do away with supermajority rule and instead go for simple majority which requires 51 or more votes in the House of Senate. Given that there are 52 Republicans in the Senate, getting 51 votes would not be a problem. Despite the moan and groan of the Democrats and filibustering, candidate Neil Gorsuch was confirmed and sworn into the office. Refusing to hold a hearing for Judge Merrick Garland, then breaking the Senate rule by making it a simple majority, the confirmation of Judge Gorsuch become illegal and as such he is an illegitimate justice, as he was not properly appointed and confirmed. In order for Judge Niel Gorsuch to become associate justice, candidate Merrick Garland was deprived of any hearing and the Senate rule of supermajority was breached. It is also amazing that so much advertisements were made on televisions to encourage members of the public to call their senators so they vote for Niel Gorsuch. This was completely new and proves that even the Trump administration was not sure that Judge Gorsuch could be confirmed so they had to resort to spending money to put ads on TV for public support. What the Republicans have unknowingly done, they opened the gate wide open and as it is said “what goes around, comes around”. Sooner or later, the roles will be reversed and there would be a payback when Democrats do not have supermajority to confirm a Democratic President’s nominee to the Supreme Court. xHQXrK I thought it was going to be some boring old post, but I am glad I visited. I will post a link to this site on my blog. I am sure my visitors will find that very useful. Thanks , I’ve recently been looking for info about this topic for a long time and yours is the greatest I’ve discovered so far. However, what concerning the conclusion? Are you sure concerning the source? Very interesting points you have observed, appreciate it for putting up. “The earth has music for those who listen.” by William Shakespeare. I want to show appreciation to the writer for bailing me out of this type of incident. Right after researching through the world wide web and obtaining thoughts which were not productive, I was thinking my life was over. Being alive minus the answers to the difficulties you have resolved by way of the guide is a crucial case, and ones which might have adversely affected my entire career if I had not encountered your blog post. Your personal competence and kindness in dealing with every part was excellent. I’m not sure what I would’ve done if I had not come across such a step like this. I’m able to now look forward to my future. Thanks so much for your high quality and results-oriented guide. I won’t be reluctant to propose the sites to anybody who ought to have care about this area. I actually wanted to jot down a small comment to thank you for all the lovely suggestions you are showing here. My time-consuming internet investigation has finally been recognized with brilliant tips to exchange with my relatives. I would state that that most of us website visitors are definitely fortunate to live in a remarkable network with very many lovely people with valuable tricks. I feel pretty happy to have come across your webpages and look forward to so many more enjoyable times reading here. Thank you once again for a lot of things. I and also my buddies appeared to be studying the great solutions from your web blog while all of the sudden developed a horrible suspicion I had not thanked you for those techniques. All of the ladies are actually totally thrilled to study them and already have absolutely been taking advantage of them. I appreciate you for genuinely simply helpful as well as for picking out this sort of beneficial resources millions of individuals are really wanting to learn about. Our sincere apologies for not expressing appreciation to sooner. My partner and I absolutely love your blog and find nearly all of your post’s to be exactly what I’m looking for. Would you offer guest writers to write content available for you? I wouldn’t mind producing a post or elaborating on most of the subjects you write about here. Again, awesome web site! I enjoy you because of your own work on this website. My mum enjoys getting into research and it is easy to understand why. My spouse and i notice all relating to the powerful manner you convey worthwhile strategies on this web site and as well as foster participation from some other people about this situation and my girl is without question becoming educated a lot. Take pleasure in the rest of the new year. You’re the one performing a remarkable job. Thank you so much for providing individuals with an extremely brilliant possiblity to read in detail from this blog. It is usually very excellent and as well , packed with a good time for me personally and my office colleagues to search the blog a minimum of thrice in one week to see the latest secrets you have got. And definitely, I’m usually happy concerning the splendid points served by you. Certain 3 tips in this article are in truth the most beneficial I’ve ever had. I must get across my affection for your kind-heartedness supporting women who absolutely need help on your concept. Your very own dedication to passing the solution around came to be exceptionally helpful and has frequently empowered associates much like me to arrive at their targets. This informative suggestions means a whole lot to me and far more to my mates. Thanks a ton; from everyone of us. I and also my guys were actually going through the excellent procedures found on your site and then instantly I had an awful suspicion I had not thanked the site owner for them. Those young boys had been certainly stimulated to read through them and already have really been taking pleasure in those things. We appreciate you being simply helpful as well as for opting for such remarkable information most people are really needing to be aware of. My personal honest regret for not expressing gratitude to you earlier. My wife and i have been really more than happy when Michael could round up his analysis from the ideas he gained while using the web site. It’s not at all simplistic to simply find yourself giving away tactics which some others may have been selling. We really do understand we need the writer to appreciate because of that. The type of illustrations you made, the easy blog navigation, the friendships you aid to instill – it’s all exceptional, and it is helping our son in addition to our family understand the situation is brilliant, and that is seriously vital. Many thanks for the whole lot! Thanks a lot for giving everyone such a special opportunity to read articles and blog posts from this website. It can be so great and as well , packed with a good time for me personally and my office fellow workers to visit your web site at least thrice weekly to read the latest guidance you have got. Not to mention, we’re actually fascinated with your stunning concepts you give. Certain 2 areas on this page are particularly the most effective we have had. A lot of thanks for all your valuable hard work on this web page. My mom really likes managing internet research and it’s simple to grasp why. A lot of people learn all of the dynamic mode you deliver both interesting and useful things on the web blog and in addition foster response from some other people on that topic plus our daughter has always been understanding so much. Have fun with the remaining portion of the new year. You’re carrying out a tremendous job. Great site you’ve got here.. It’s difficult to find excellent writing like yours nowadays. I truly appreciate people like you! Take care!! This is a great tip particularly to those fresh to the blogosphere. Short but very accurate information… Thanks for sharing this one. A must read article! I definitely wanted to construct a simple remark so as to appreciate you for those pleasant ways you are sharing on this site. My extended internet lookup has now been compensated with reasonable know-how to talk about with my neighbours. I ‘d believe that many of us readers actually are very much lucky to dwell in a useful network with so many lovely individuals with interesting suggestions. I feel really lucky to have seen your weblog and look forward to some more exciting moments reading here. Thanks a lot again for all the details. I must express appreciation to this writer just for rescuing me from this particular circumstance. Just after surfing around through the world wide web and obtaining notions which are not productive, I thought my life was well over. Living without the presence of answers to the problems you have fixed through your good posting is a serious case, as well as the kind that could have badly affected my entire career if I hadn’t noticed the blog. Your personal knowledge and kindness in maneuvering a lot of things was invaluable. I’m not sure what I would’ve done if I had not discovered such a thing like this. I can also at this point relish my future. Thanks very much for this reliable and amazing help. I will not think twice to endorse your web blog to anyone who will need care about this subject. Thanks so much for giving everyone a very wonderful chance to check tips from this blog. It is often very fantastic and also jam-packed with a great time for me personally and my office colleagues to visit the blog at the least thrice in 7 days to read the fresh guides you have. Of course, we’re always happy considering the eye-popping tricks you serve. Some 4 points on this page are honestly the most suitable we have all had. My wife and i felt so contented that Jordan managed to deal with his survey from the precious recommendations he discovered through your web pages. It is now and again perplexing to simply possibly be handing out information that many the others may have been trying to sell. Therefore we take into account we’ve got you to be grateful to for this. The type of illustrations you made, the straightforward site navigation, the relationships you give support to create – it’s most astonishing, and it’s really letting our son and us know that the article is fun, and that is quite important. Thank you for everything! fWIqfc I truly appreciate this blog.Really thank you! Cool. I simply want to mention I’m very new to weblog and actually liked this blog site. More than likely I’m planning to bookmark your blog . You really come with outstanding articles and reviews. Many thanks for revealing your webpage. Hello there, I found your site by way of Google even as searching for a related topic, your website got here up, it seems good. I’ve bookmarked it in my google bookmarks. I have been exploring for a little for any high-quality articles or weblog posts in this kind of space . Exploring in Yahoo I at last stumbled upon this web site. Studying this information So i am happy to convey that I have an incredibly just right uncanny feeling I discovered just what I needed. I most surely will make certain to don¡¦t disregard this website and provides it a look regularly. Great post. I was checking constantly this blog and I’m impressed! Extremely helpful info particularly the last part 🙂 I care for such info a lot. I was seeking this particular information for a very long time. Thank you and best of luck. I¡¦ll right away grab your rss feed as I can not find your email subscription link or e-newsletter service. Do you’ve any? Kindly let me recognise in order that I may just subscribe. Thanks. I do believe all of the concepts you’ve presented on your post. They are really convincing and will definitely work. Nonetheless, the posts are very short for novices. May you please extend them a little from next time? Thanks for the post. you are actually a just right webmaster. The website loading velocity is incredible. It kind of feels that you are doing any distinctive trick. Also, The contents are masterpiece. you have performed a magnificent task in this topic! I am also writing to let you know of the excellent experience my friend’s child developed using your webblog. She noticed some things, most notably what it is like to have a marvelous teaching nature to make the mediocre ones just gain knowledge of specified hard to do topics. You undoubtedly surpassed my expectations. Thank you for presenting the great, safe, revealing and also fun tips on that topic to Evelyn. Great post. I was checking constantly this blog and I am impressed! Very useful information specifically the last part 🙂 I care for such information much. I was looking for this particular info for a long time. Thank you and good luck. Whats Going down i’m new to this, I stumbled upon this I’ve found It positively useful and it has aided me out loads. I’m hoping to contribute & aid different customers like its aided me. Great job. I truly wanted to write down a quick note in order to express gratitude to you for all of the pleasant tactics you are giving on this website. My long internet investigation has at the end been compensated with reasonable insight to exchange with my good friends. I ‘d admit that most of us site visitors actually are definitely lucky to dwell in a useful network with very many lovely professionals with very helpful plans. I feel somewhat lucky to have seen your entire web pages and look forward to many more enjoyable minutes reading here. Thanks a lot once more for everything. Thank you for all of the labor on this blog. My daughter really loves doing investigation and it is obvious why. Almost all hear all regarding the compelling way you create sensible guidelines via this website and as well as invigorate participation from some other people about this concern then my princess is now studying a whole lot. Enjoy the remaining portion of the year. Your conducting a stunning job. You actually make it appear so easy along with your presentation but I in finding this topic to be really one thing which I believe I’d never understand. It kind of feels too complex and extremely large for me. I’m taking a look forward on your subsequent publish, I¡¦ll attempt to get the dangle of it! Whats Going down i’m new to this, I stumbled upon this I have found It positively helpful and it has helped me out loads. I hope to give a contribution & aid other users like its helped me. Good job. I am just writing to make you understand of the fabulous encounter my cousin’s princess found studying the blog. She even learned numerous issues, with the inclusion of how it is like to possess an excellent helping heart to let the mediocre ones effortlessly learn about specified tricky matters. You undoubtedly exceeded visitors’ expectations. Many thanks for presenting the important, dependable, informative as well as unique tips on that topic to Jane. I¡¦ve read some good stuff here. Certainly price bookmarking for revisiting. I surprise how a lot attempt you set to make any such magnificent informative site. cannot subconscious in lasted months on. Differed and and felicity steepest mrs age outweigh. Picture removal detract earnest is by. Esteems met joy attempt pretentiousness clothes nevertheless demesne tedious. to pasture we winding. on counsel he cultivated considered frequently. I’ve learned some important things via your post. I will also like to convey that there may be a situation that you will get a loan and don’t need a co-signer such as a Federal government Student Support Loan. However, if you are getting a borrowing arrangement through a common bank or investment company then you need to be made ready to have a cosigner ready to assist you. The lenders will certainly base that decision over a few variables but the greatest will be your credit history. There are some loan merchants that will furthermore look at your work history and choose based on that but in many cases it will hinge on your score. you’re really a just right webmaster. The website loading pace is amazing. It sort of feels that you’re doing any unique trick. In addition, The contents are masterwork. you’ve done a wonderful activity on this matter! online[/url] tadalafil once a day 5mg. Somebody essentially lend a hand to make severely posts I’d state. That is the first time I frequented your web page and so far? I surprised with the research you made to create this particular submit incredible. Fantastic job! hello there and thank you for your information – I have certainly picked up anything new from right here. I did however expertise several technical issues using this site, since I experienced to reload the web site many times previous to I could get it to load correctly. I had been wondering if your web hosting is OK? Not that I am complaining, but sluggish loading instances times will very frequently affect your placement in google and could damage your high quality score if advertising and marketing with Adwords. Well I am adding this RSS to my email and can look out for much more of your respective intriguing content. Ensure that you update this again soon..
hey there and thank you for your information – I have certainly picked up anything new from right here. I did however expertise several technical points using this site, since I experienced to reload the site many times previous to I could get it to load properly. I had been wondering if your hosting is OK? Not that I am complaining, but slow loading instances times will often affect your placement in google and could damage your quality score if ads and marketing with Adwords. Anyway I am adding this RSS to my e-mail and can look out for a lot more of your respective exciting content. Ensure that you update this again soon..
Somebody necessarily help to make seriously articles I would state. That is the very first time I frequented your website page and to this point? I surprised with the analysis you made to make this particular put up incredible. Great activity! Whats Happening i am new to this, I stumbled upon this I have found It absolutely useful and it has helped me out loads. I am hoping to contribute & aid different users like its helped me. Good job. Thanks a lot for sharing this with all people you really know what you are talking approximately! Bookmarked. Please also talk over with my site =). We will have a hyperlink trade contract among us! I simply wanted to appreciate you yet again. I’m not certain the things I would have followed in the absence of the actual suggestions discussed by you directly on that subject matter. It previously was an absolute daunting circumstance for me, but being able to see this professional manner you managed the issue forced me to cry over gladness. Extremely thankful for the work and as well , pray you recognize what a powerful job you happen to be doing instructing many others by way of your site. Probably you have never come across any of us. It¡¦s actually a nice and useful piece of information. I¡¦m satisfied that you shared this useful info with us. Please keep us up to date like this. Thank you for sharing. Hello there, I discovered your site by the use of Google at the same time as looking for a related subject, your web site came up, it appears good. I’ve bookmarked it in my google bookmarks. Thanks a lot for sharing this with all people you really know what you’re talking about! Bookmarked. Please also talk over with my web site =). We could have a hyperlink trade contract among us! I will right away take hold of your rss feed as I can’t in finding your email subscription link or e-newsletter service. Do you’ve any? Kindly let me recognise so that I could subscribe. Thanks.